International Journal of Research in Health Sciences,2018,6,3,41-44. We report a case of a twenty day old girl infant who presented with an unilateral breast swelling and was admitted in the NICU for septicaemia. An ultrasound imaging of the breast was performed to rule out the possibility of a breast abscess but the imaging findings concluded the diagnosis of neonatal mastitis. We would like to emphasize based on our case experience that in paediatric cases even a small trivial localised infection can cause generalised potentially fatal complication of septicaemia which is alarming and ultrasound imaging plays a crucial role to prevent unnecessary invasive interventions and aids in prompt initiation of medical treatment. 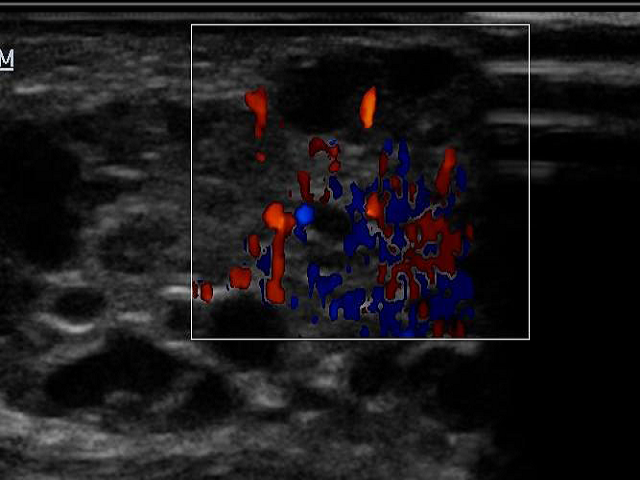 On colour Doppler interrogation, the hypoechoic areas within the right breast shows mildly increased vascularity.